Imagine working months to lay the foundation and grow your Amazon business. You have done all the product research, sourcing, and importing, and finally your sales are catching some momentum as you climb the Best Seller Rank. Then you are suspended. The suspension is out of the blue, and the reasons are vague. This is a rational fear, and happens, but is a preventable situation. In this webinar replay, Cynthia Stine of Online Sales Step by Step reviews what Amazon metrics are critical to review to and track to avoid Seller Suspension. There are several main takeaways from this impactful presentation. Amazon’s primary concern is how the buyer’s experience is. Period. If a customer sends a negative review or complains about their purchase, whether ugly packaging, dirty products, or defective products, an unhappy customer is a major concern. Furthermore, Amazon doesn’t care how long you’ve been selling or what your volume is, even if you are a high volume seller you are still at risk for a suspension if you don’t pay attention. Algorithm has been changing regularly. No one is exempt, however, there are still actions that you can take to prevent yourself. Cynthia recommends that you can prevent negative feedback by changing how you treat your customers to improve customer satisfaction. In many ways, this comes down to improved communication with the buyer (ie follow up for any poor product or seller feedback), and full communication of what the product is before the customer purchases it. This can minimize any confusion post-purchase, where a customer can complain about a disconnect between the product listing and the actual product received. This ties into what Amazon, and Cynthia, describe as “Product Quality”. Private label sellers are especially prone to this, where customers have issues with product quality. So if the private label marketing or packaging looks cheap, or the product itself is poorly executed, buyers start to wonder about their purchase and can send in negative feedback which can be damaging to a Seller Account. “Used sold as New” – This can include deceptive selling, trying to pass something off as new even if it is new. Or it can simply be a dirty or damaged product that the customer thinks is used, even though it is new. “Not as Described” – a listing problem. There’s a disconnect between what they saw online and what they received. “Defective” – A product doesn’t function as intended. “Not As Advertised” – especially applicable to supplements. Not stronger, skinnier, more virile. Checking this report on a weekly basis is something that Cynthia recommends, so that you can preemptively address any negative feedback. You can see that any negative feedback may have a potential reason, which you should also start monitoring and cataloging. If you sell several products, you can sort this by ASIN. This helps you figure out where you are having issues, by particular ASIN, and why they are having issues. For example, if you are experiencing a lot of returns, you are able to figure it out by reading through the comments. One important thing to note is that Negative Feedback includes all negative comments, even the negative feedback has been removed. This is important because Amazon’s algorithm will scan for keywords like “counterfeit”, “fake”, or whatever other red flags they scan for. How Can You Prepare Yourself To Appeal A Suspension? 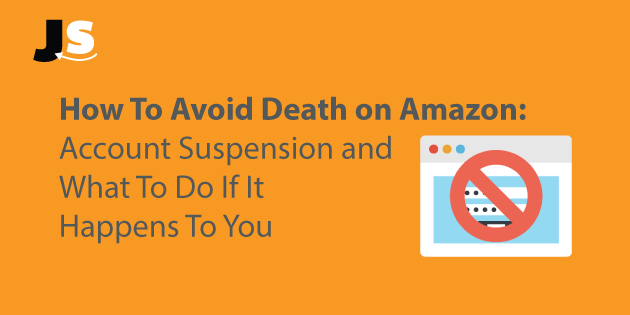 Be Straightforward: Cynthia recommends that when presenting your case to Amazon if you have been suspended, take your time and be thorough. That means collect all the data that you may need, whether it is receipts to prove your sourcing, emails, testimonials, photos, or whatever else. It is important that this case is presented in a non-emotional case, that does not include emotion or extraneous information. Give Amazon exactly what they want, and make it a “just-the-facts” conversation. Show what you have learned: find exactly what the causes were, find the negative feedback reviews, and tell Amazon how it will never happen again with that product, or any product you sell. The plan will effect all of the products that you sell, so that Amazon will not need to worry about any negative customer feedback issues with products that you sell. Make it simple: concise, clearly annotated and marked up. Don’t make it too complicated, they have less than 3 minutes to review. There are no shortcuts on who to contact if something happens to your account. You have to reach out to the email contact that they provide. The time frame for reinstatement totally depends on your account, the cause of suspension, or how busy Amazon is. Wishing you the best of luck in Amazon sales! While keen on the FBA model, it very much gives me pause for thought. Does anyone have any idea on how likely such suspensions (either listing or account) are to occur? I only ask, as it would give some idea of how to manage your business to take account of this. Otherwise, this appears to look like something which is very much in the unknown-unknown category and therefore v. dangerous to the FBA business model. I got my account suspended and got the notification that it is a permanent one and I can no longer sell on there. Been trying to find ways to get back on, but Amazon keeps suspending me. Am completely loss. I was thinking of buying an Amazon account from sellers from the Aspkin forums or Auction Essistance, but a little hesitant since I do not know if I will get suspended again. I didn’t get one thing. If there is a product with several variations and it gets 3 negative returns, 1 negative return for each different variation. Is that the case where you advice to stop selling? Or you have meant 3 negative returns per 1 asin? That’s funny because I see Amazon violating this policy all the time. They jump on listings with incorrect images and don’t even bother to correct them. But hey I guess it is their sandbox. Would just be nice if they led by example. Your main image is violating the Amazon’s policies you should have the main image just the item, you have your logo and some text on the main image, they can suspend just for this.